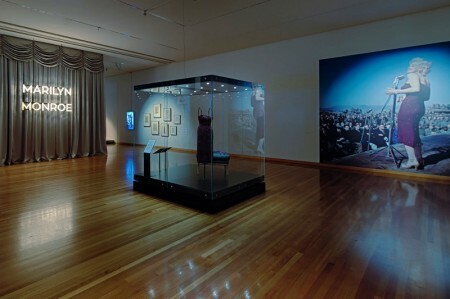 One of Marilyn’s most iconic dresses, rarely seen today, is currently on display as part of Twentieth Century Fox Presents Marilyn Monroe, the new exhibition at Bendigo Art Gallery, as Scott Fortner reports for his MM Collection blog. “Many of the items on exhibit have been seen around the world, including the US, Italy, Germany, Japan, Canada, Spain and Prague. However, one item in particular hasn’t been seen by the public in over 20 years, and that’s the striking purple gown that Marilyn Monroe wore throughout her Korean USO tour in 1954 when she performed for US troops stationed there. Marilyn is often quoted as saying performing in Korea was one of the highlights of her life.